Your child’s smile is probably one of your favorite things in the entire world, and you’d do just about anything to keep it healthy and strong as your little one becomes not so little. As such, important factors include regular dental checkups and cleanings in addition to introducing oral hygiene techniques at an early age. When you bring your child to Cochell Family Dentistry, our family dentists will examine their teeth, gums, bite, and jaw as well as look for early signs of problems that may develop in the future. With this knowledge, they can provide a number of conservative interceptive treatments in order to prevent sizeable issues later. Just like with most adults, we recommend that all children have at least two checkups and cleanings per year. Has your child been to the dentist yet? 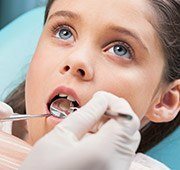 It may surprise you as to what age children should see a dentist. Our recommendation is the same as that of the American Dental Association and the American Academy of Pediatric Dentistry. Both state to bring your child in within six months after their first tooth appears but no later than the child's first birthday! And of course, if you ever have any questions about taking care of your child’s teeth, we’re always happy to answer them. To learn more about your child’s dental care or schedule their next appointment, contact us today.